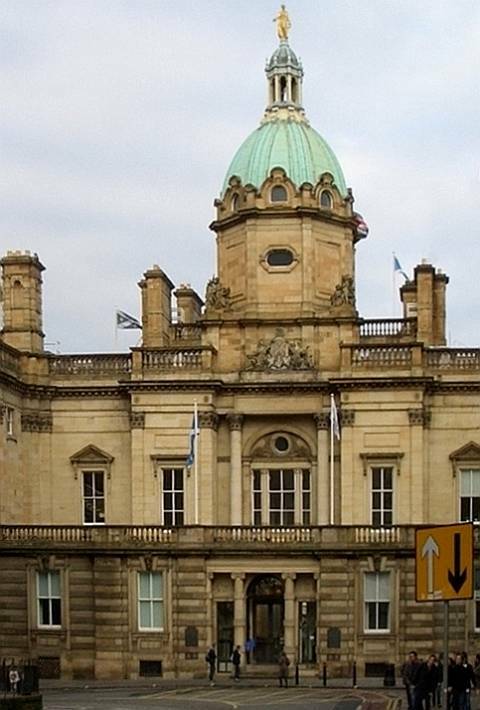 The Bank of Scotland (now HBOS plc), seen from Princes Street.. Older building by Robert Reid & Richard Crichton (1802) encased and extended by David Bryce (1803-76). 1864-71. 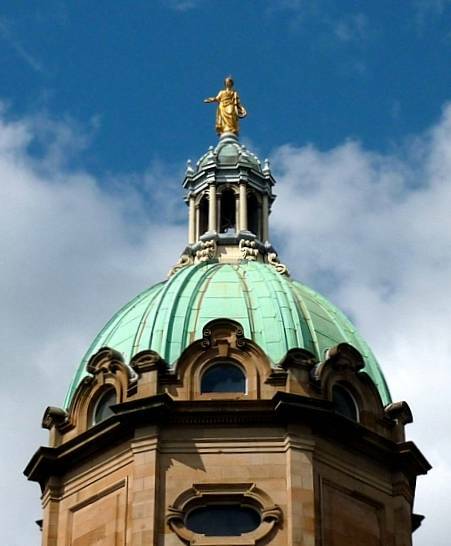 Architectural sculpture, including the gilded Fame at the top of the dome, by John Rhind (father of William Birnie Rhind). Bank Street, Edinburgh. Variously described as "Roman-Baroque" (Gifford et al. 219) and "Franco-Italian" (Glendinning and MacKenechie 162), this building stands on the northern edge of Edinburgh's old town, overlooking Princes Street and greatly contributing to the cityscape there. Headquarters of "the oldest surviving banking institution in the United Kingdom" (McNab 196), it acquired its dramatic profile when David Bryce partially encased the older building by Read & Crichton. He retained the central part of their front elevation on the south, but transformed it in other ways, adding the dome on its "tall octagonal drum with lozenge-shaped windows and topped by a lantern," and also its parapet. The latter is "adorned with vigorous sculpture with which the dome forms a composition equally effective from any viewpoint" (Gifford et al. 219). Bryce also extended the older building by adding columns, pilasters and towers so that it "almost constitutes an artificial hill with its piling-up of rustication, columns and domes" (Glendinning and MacKenechie 162). It has recently been restored and modernised inside. 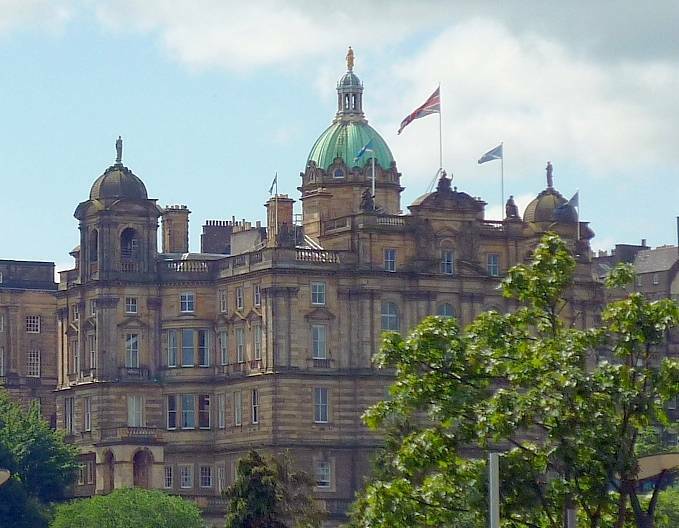 Buildings overlooking Princes Street Gardens, with the bank on the far left. Gifford, John, et. al. Edinburgh (The Buildings of Scotland series). London: Penguin, rev. ed. 1991. Glendinning, Miles and Aonghus MacKechnie. Scottish Architecture. London: Thames & Hudson, 2004. McNabb, Christopher. Pocket History of Edinburgh. London: Flame Tree (for Lomond Books), 2008.